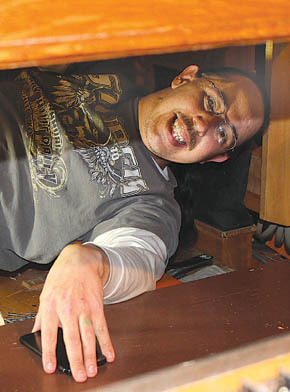 During recent restoration of the pipe organ at the Albion United Methodist Church, Clifford Burnette of Sioux City, IA, an employee of the Darrow Pipe Organ Co., was inspecting the “box” under the organ pipes to make sure it was airtight. This was just one step in the lengthy process of repairing/upgrading the church organ. See feature by Twylla Crosby in the July 3 Albion News Print & E-Editions.